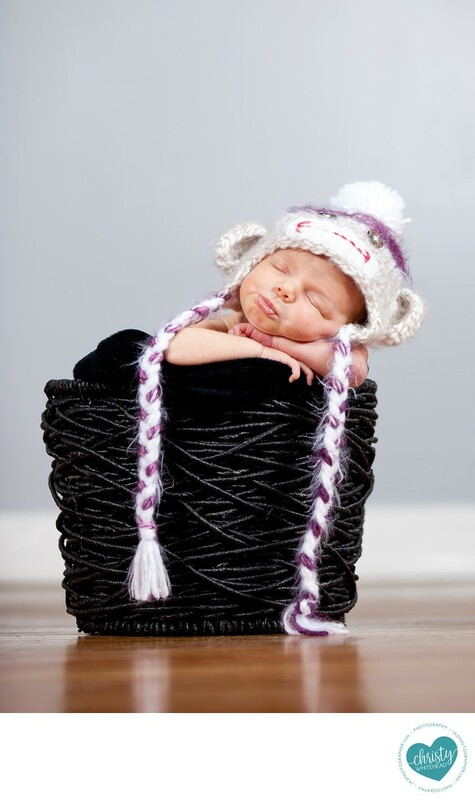 Pouting face sock monkey baby - Newborn Photography | Schedule Your Newborn Shoot Today! I love those little sock monkey hats! I have them in several colors in the studio for newborn sessions. One of the most important parts of photography isn’t the props, or the camera, or the lens. In fact, it’s probably something you would never expect. It’s lighting. While we live in gorgeous sunny Florida, it doesn’t mean that we always have the best lighting. The direction your home faces, the time of day and the time of year all play a part in quality of light. When we’re already working around infants unpredictable schedule, variances in one of the most important aspects of photography - lighting - can be your worst enemy. Which is why here at the studio we have invested in studio lighting. Which allows me to obtain the best lighting not matter the weather, the time of day or time of year here at the studio. Posing newborns requires a lot of props! Even a simple image of a naked newborn on blanket requires more props than you would realize including stands, posing blankets, stuffers, bean bags and more. Then there are the usual props including baskets, backdrops, stands, wraps, outfits, boats and more. Newborn photographers definitely don’t pack light! You don't have to clean! In order to have good photos clear of distractions and make enough room for props a certain amount of cleaning is in order. At a time when you’re not sleeping through the night and you’re busy dealing with the needs of a newborn, cleaning is the last on anyone’s “want to do” list. Car rides lull babies to sleep, since we want them nice and sleepy for the session this is perfect.